Primary Natural Resources hydropower, gold, coal, oil. LANDLOCKED AND MOUNTAINOUS, the Kyrgyz Republic achieved its independence in 1991 following the collapse of the Soviet Union. Kyrgyzstan features spectacular mountain vistas and incredible natural beauty reminiscent of SWITZERLAND. Despite its natural beauty and recent attempts to develop a thriving tourist industry, Kyrgyzstan remains mired in poverty. Additional challenges include implementing democracy, combating ethnic tensions, and thwarting terrorism. 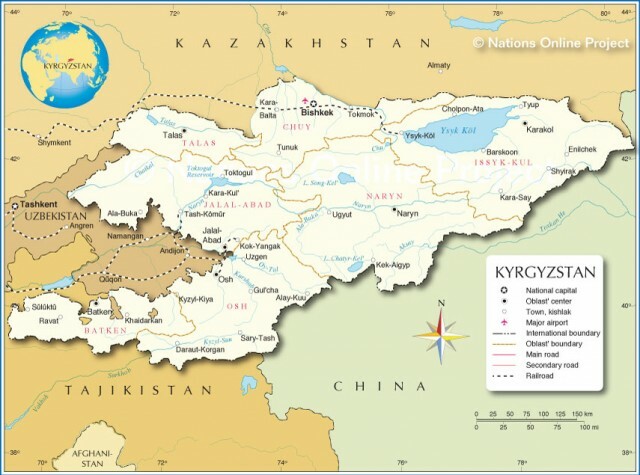 Central Asia’s second-smallest country in terms of area, Kyrgyzstan borders KAZAKHSTAN to the north, CHINA to the east, TAJIKISTAN to the south, and UZBEKISTAN to the west. Kyrgyzstan is dominated by the TIAN SHAN (primarily) and Pamir (in the south) mountain ranges. The vast majority of the country (roughly 75 percent) is continuously covered by snow and glaciers. Traversing the Tian Shan remains relatively difficult, as a summer trip from the northern capital of Bishkek to the southern second-largest city of Osh (a distance of 186 mi or 300 km) takes more than 10 hours by automobile. Kyrgyzstan is also home to numerous alpine lakes, the largest and deepest of which is Lake Issyk-Kul, located near the Kazakh border in the north. The lake reaches a depth of 2,300 ft (700 m); its clear, sky-blue water and health resorts make the lake a popular tourist destination. For a country its size, Kyrgyzstan has surprising climatic variability, ranging from polar to dry continental through the mountains, to temperate northern foothills, to subtropical in the southwest. Kyrgyzstan’s most valuable natural resource may be its gold deposits. The Kyrgyz republic was home to the Soviet Union’s largest gold mine (Makmal), which continues to be one of the largest proven gold reserves in the world. Kyrgyzstan’s population is ethnically diverse, including Kyrgyz (64.9 percent), Uzbek (13.8 percent), Russian (12.5 percent), Dungan (1.1 percent), Ukrainian (1 percent), and Uygyr (1 percent) peoples. Population distribution is concentrated in the Fergana, Talas, and Chu valleys and is centered in the cities of Bishkek (the capital, 2004 population 866,300) and Osh (2004 population 229,700). Most citizens are adherents to the religion of Islam (75 percent), although a sizable minority of Russian Orthodox (20 percent) exists. A secular state, Kyrgyzstan has two official languages, Kyrgyz and Russian. Kyrgyzstan’s economy, like that of other poor countries, is dominated by the agricultural sector. A full 55 percent of the labor force is engaged in farming. Nomadic herders raise sheep (for both meat and wool), cattle, and yaks. Other agricultural products include cotton, tobacco, and a variety of vegetables. Industry, which accounts for just 15 percent of the labor force, is limited to gold, small machinery, textiles, and food processing. During its first decade of independence, Kyrgyzstan implemented more market-oriented economic reform but experienced slower economic growth than the other former Soviet republics of Central Asia. Perhaps the most pressing geographical/political issue facing Kyrgyzstan is its complex western boundary with Uzbekistan and Tajikistan. Three large Tajik exclaves exist entirely within Kyrgyzstan’s borders, and a serious boundary dispute continues with Uzbekistan. Here, seemingly arbitrary boundaries fragment ethnic groups and unite dissimilar peoples. Kyrgyzstan’s relative location has also fostered a growing problem of illegal narcotics traffic. The country has become a corridor for the movement of opium and heroin produced in AFGHANISTAN and Tajikistan, bound for the European market. Combating terrorism represents an additional problem confronting Kyrgyzstan. Radical Islam has penetrated the country, and Osh is considered by many to be the Soviet Central Asian headquarters of Wahhabism.